DES MOINES – The Iowa Barnstormers have signed quarterback Yianni Gavalas to the 2019 roster, Head Coach Dixie Wooten announced today. Gavalas (6-2, 215, LIU Post) joins the Iowa Barnstormers for his rookie season in the Indoor Football League (IFL). Collegiately, Gavalas spent four years at Saint Anslem College where he appeared in 32 total games and collected 776 passes of 1,213 attempts for 8,307 yards and 52 touchdowns. Gavalas also rushed 218 times for 514 yards and 12 touchdowns. During his time with the Hawks, Gavalas racked up several honors including Northeast-10 All-Rookie Team, the New England Writers Association Gold Helmet Award, several “Player of the Week” awards, and appearances on both the Dean’s List and the Commissioner’s Honor Roll. In 2017, Gavalas transferred to LIU Post for his graduate season. Gavalas appeared in 10 games with the Pioneers where he collected 257 passes of 363 attempts for 3,087 yards and 37 touchdowns leading the Northeast-10 in almost every category for passing. 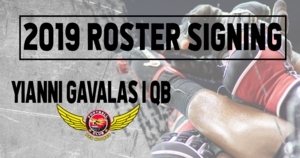 Gavalas is the second Quarterback to enter the Iowa Barnstormers 2019 Training Camp. Season Tickets for the 2019 Iowa Barnstormers season are available now! For as low as $80 per seat, fans can enjoy the action from the same great seat location each game. For more information, call the Barnstormers at (515) 633-2255 or log on to www.theiowabarnstormers.com.